Keep it safe – above the belt……. Motocross chest protectors are very important to your safety. Fox and other manufacturers offer high quality protectors for your ribs and upper body. You do need them for whatever type of activity your doing on your dirt bike. It doesn’t matter if you’re riding a motocross bike or another make of smaller pit bike; gear and protection is crucial. It’s a good idea to subscribe to a motocross magazine; it will have reviews and tips, plus adverts of all the latest tuff gear to buy. The dirt track and most motocross circuits can be a precarious place to be. Yes you might have all the motorcross gear such as gloves, MX helmets and goggles but you will need motocross chest protectors to go under that cool blazin' jersey. Enduro & dirt bike body armour has become a lot more affordable for track days and freestyle motor cross. 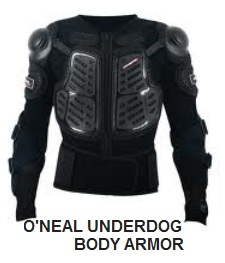 Upper body protection is an absolute must-have when riding your aprilia or yamaha motorbike in races and during stunts. We looked at a few sites that should make your days at dirt tracks a little safer. Motorcycle-superstore.com had a whole host of stuff for the enduro pro and freestyle rider in relation to motocross chest protectors. In the mens motocross chest protectors range there was the Thor Motocross Impact Rig SE at $139.95 and an Alpinestars Bionic 2 Protection Jacket came in at about $229.95. The Alpinestars trial set, had CE certified GP shoulder and elbow protectors, CE certified (level 2) Bionic Back Protector and Adjustable arm and shoulder straps to get a snug fit for the circuit moves you'll be doing. The womans mx range had a Fox Racing Launch Suit selling for $179.95 and an O'Neal Racing Underdog Body Armour set; on Sale at $143.99, which was quite a bit below RRP. Also motorcycle-superstore.com have a specially designed youth range. Here we uncovered an Alpinestars Youth Bionic 2 Protection Jacket for $179.95 or how about an AXO Youth Air Cage selling for $116.99. The AXO Racing Youth Air Cage, includes secure arm adjustment, Built-in kidney belt and new shoulder, elbow, forearm and hinged back plastics all sitting in a Nylon HT body construction vest. That should certainly see you over most dirt tracks and long enduro tours! Take the punch out of that body-blow. Getgeared.co.uk had a page dedicated to Motorcycle Body Armour for the track ( aka motocross chest protectors). For cheap motorcross apparel the SUPER SHIELD CE Protector Jacket for a small £99.99 was hard to beat. This is a Full body armour jacket for most tracks. It has a mesh material for airflow, conforms to EC safety standard EN 1621-1 and EN 1621-2 and includes CE protectors on shoulders, elbows, underarms and back. An Underarm Velcro fastening and Velcro waistband should ensure this wont fall off no matter how many race events and jumps you do. Getgeared.co.uk also had a clearance sale of motocross chest protectors, with the full body protection jacket from VANUCCI going for £129.95 - Thats £20 off RRP! The VANUCCI jacket has composite materials with dual density multi-layer foam protectors, to cushion your rear in any track bike crashes. Slyfoxmx.com had green and blue motorcross jackets, plus a FLY Convertible Roost Guard for only $79.95. But they had a fine FLY "Air-Strike" Rock Deflector being sold at $54.95. 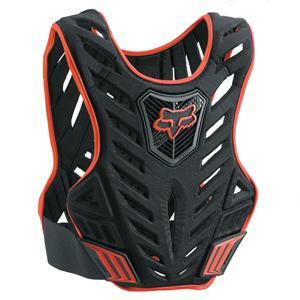 Built from a "DGP" polymer construction, air-flow vents and Adjustable shoulders this protector is ideal for fmx motorcross shows and any usa races you care to mention. The younger dirt bike rider might find the Answer Youth Apex Protector at $71.95 and the Answer Youth Overspray Protector for only $53.95 cheap enough to get started in moto cross events, without spending a small fortune on gear. The Answer Youth Overspray Protector has lower profile adjustable shoulders with excellent arm protection. The polycarbonate front and back panels, and range of sizes should make this a must for riders of MX motor bikes on a tight budget. Ebay.co.uk of course is always full of motocross chest protectors, and body armour at knock down prices. 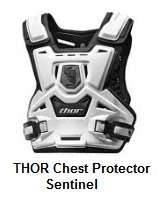 A Chest protector (body armour), for kids aged 4 yrs - 8yrs had 4 Bids coming in at £21.00 + £5.00 shipping, plus a THOR Chest Protector - "Sentinel" for Adults had a buy it now price of £79.99, with free shipping! So use these sites above to buy MX clothing and motorbike protection. Great for modern super dirt bikes and heck even classic motorcycles too. The pics on all these pages were clear and easy to see, and we could navigate through the websites pages quickly to find precisely what we wanted. Upper body protection won’t stop you from having a motocross accident, but will save you a trip to the hospital – in many cases. You want to be the star on the motorcross stunt pictures on famous dirtbike posters, not on the accident clips on youtube – so keep safe and ride within your ability - you'll do fine. Maybe you'll even help with the reviews of the best chest protectors that are sold online - it’s good for manufacturers to know your opinions. Tell us what are your favourites? And what works best for you? Perhaps you have the ability to lift a motocross trophy one day, as you’re a skilled rider. But you'll never get there if injuries to your body let you down. Rugged quality gear should give you the confidence and reliability for you to push your limits, and if you do fall badly you should be able to get up and walk away - thanks to your MX armour.